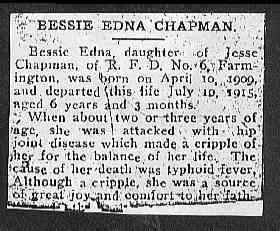 "Obituary - Bessie Etna Chapman"
Married: She was never married. Bessie Edna, daughter of Jesse Chapman, of R. F. D. No. 6, Farmington, was born on April 10, 1909, and departed this life July 10, 1915, aged 6 years and 3 months. When about two or three years of age, she was attacked with hip joint disease which made a cripple of her for the balance of her life. The cause of her death was typhoid fever. Although a cripple, she was a source of great joy and comfort to her father ________ (missing half of the last line on obituary).